Well Maintained – Ideal Lock Up & Go! 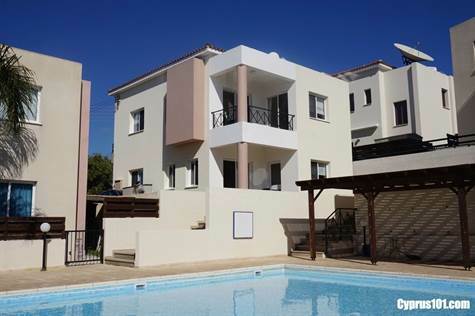 Konia Detached Villa for Sale, Paphos – This well presented 3 bedroom detached villa in Paphos is situated on a small project of 16 properties in a quiet residential area of the popular village of Konia. The home is only a few kilometres east of Paphos Town and the coast of Cyprus.Many residents choose Konia for the traditional village life and very convenient location and easy distance to Pafos town and the Mediterranean coast, and for those who are keen golfers, there are four excellent golf courses within a short drive away. The ground floor accommodation features a comfortable lounge, spacious dining area, large corner kitchen, guest cloakroom and useful storage cupboard. Patio windows to the front and rear open on to covered verandas and windows to the side provide further light to the living space. The kitchen is well equipped with built-in oven, electric hob, cooker hood, fridge/freezer, dishwasher and washing machine. Upstairs are three good size double bedrooms, all with fitted wardrobes. The master bedroom has an en-suite shower room and there is a family size bathroom accessed directly from the hallway. The master faces the front of the property and has a private balcony. Bedrooms two and three face the rear and have patio windows providing easy access to a covered balcony with wonderful sea views which overlooks the impressive communal swimming pool. The property is an ideal lock up and go residential or holiday home for those who enjoy the benefit of having a detached property and yet do not wish to have a large garden or swimming pool to maintain. It has been well maintained by the current owners and has good quality furniture and finishes. To the side is a gated driveway with space for parking two cars.